Statement revoking the attorney's powers from a set date, decided by you. A legal document written in an easy to use style. An enduring power of attorney is used to allow someone else to look after your affairs when you are no longer able to do so yourself. Most people need one, because medical science is better at preserving our bodies than our brains. Before the principal (the person appointing the attorney(s)) has become mentally incapable, they can revoke the power at any time. The only way to reverse the powers subscribed is to revoke it officially using this document. It is necessary to inform the attorney(s) of the revocation as the attorney's authority does not cease until he or she receives notice of the revocation. 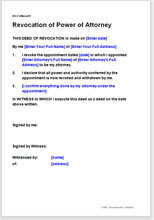 A copy of the Deed of Revocation should be sent to each attorney. Suitable for anyone who has made an EPoA who is not yet mentally incapable.